Happy Sunday internet family! Welcome to my first ‘how to’ blog post – I hope this might become a bit of a series for you to enjoy – for a bit of fun, or to improve your own photography. Today I’m going to show you how to set up a very makeshift home studio to photograph small objects, pets or products. I also used this set up to photograph my Queensberry album samples. This blog will also share a few protips for photographing kittens. Give it a go and share your pics with me on facebook. – A feathery cat wand, or similar, or catnip treats. First step is to set up your mini studio: place the stool a few metres out from the giant window, set your broom on top so it balances and tape it onto your stool. Then lay your paper or fabric out so that it forms a gentle curve towards the window, tape the top edge to your broom stick. Position yourself between the new backdrop and your big window. PROTIP: the bigger your window, the more light you’ve got to play with, I am lucky to live in an old Wellington villa with a double height bay window, on an overcast day I had plenty of light to photograph my kitty zipping around. If your window is small, try a dark backdrop or increase your ISO. Now you have your studio set up, its time to bring in your subject. Roll up, roll up, my naughty 6 month old kitten Harry. If your cat is anything like mine, you will have no trouble coaxing him onto the paper. If not, try kitten treats or a feathery wand. PROTIP: new feathery cat wands also double fantastically as ticklers to entertain cheeky 3 year old children! Using your feathery wand, attract the attention of your cat then quickly flick the feathers up to your face to get the cat to look at your camera. Squeaky bird noises or any surprising sound you can muster, may also get your cat looking down the lens. You’re going to have to be quick though! Get closer and further back, or zoom with your camera, moved around and up and down, to get a range of different shots. Your cat will probably only entertain your photography goals for a maximum of a few minutes, don’t force the topic, patience is key. Try hanging out in the room and wait for your cat to become interested in your toys or treats and you might get a second chance. 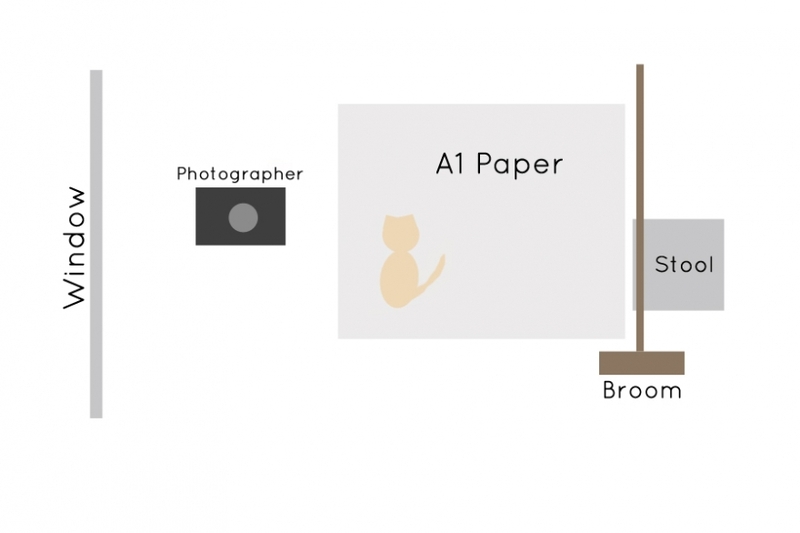 Expect your cat to spend a lot of time racing or roaming on and off the paper, remember he has no idea what you are trying to achieve, so work within his interests – put a treat on the paper, let him munch it, then grab his attention with a sound. For those following this ‘how to’ working with a simple point and shoot camera, let your camera do the work for you on this step – turn your flash off if you can. I photograph with Nikon DSLR cameras – d700 to be exact. For these pictures of Harry I used both my 50mm F1.4 and an old Nikkor 28-105mm macro lens that I got off trademe for only around $160 – an incredible bargain. With a simple studio set up like this its easy to set your exposure manually then forget about it – I had the following settings: ISO 3200, F4.5, 1/500s. Your settings will depend on the size and strength of your light source (window), with a white backdrop like mine, I suggest pushing your exposure about a stop or two past that recommended by your camera’s light meter – this is especially important if your cat is black. 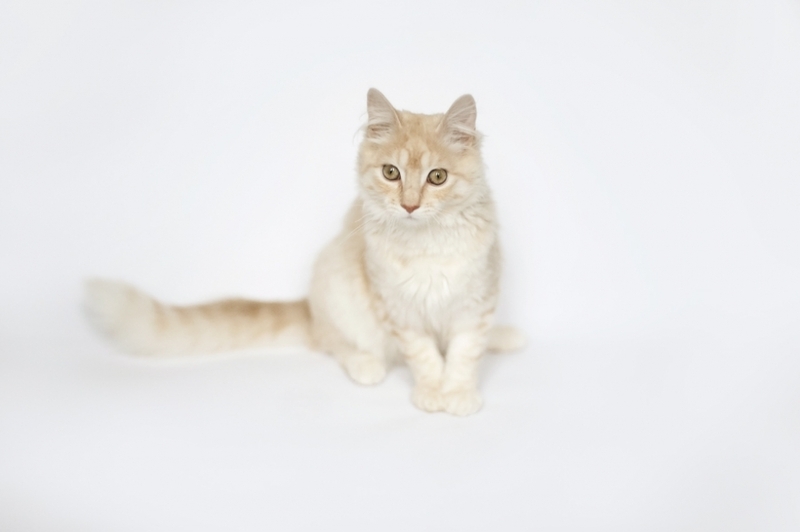 There will be some variation to your exposure as you get closer and further away from your cat, so if you struggle with manual settings try aperture priority, which will adjust your shutter automatically. 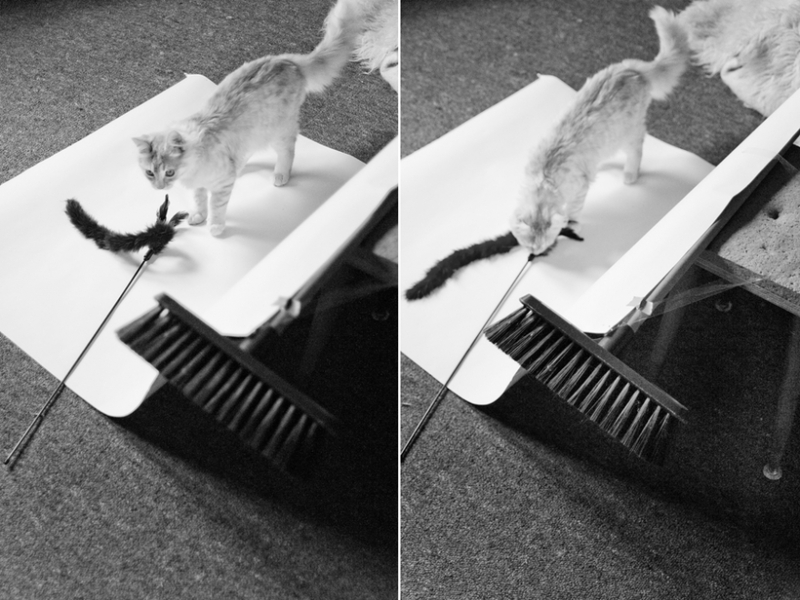 With a quick moving cat, be careful not to drop your shutter down too slow or you will get blurry pictures. Its important to get your focus right on the money when you’re working with shallow apertures. Use the arrow button at the back to move your point of focus and snap it right on the cats eyes. PROTIP: be watchful of your own shadow. When you position yourself between your window (light source) and your backdrop then you run the risk of killing your own light. Get low to avoid casting a shadow on your cat and mucking up your exposure. Once you have snapped as many pics as your kitty will give you, and loaded your photos to your computer, you might have a few tweaks to make to finish off your photos. Editing the photos from your mini studio set up should be pretty simple if you’ve set your exposure right. I used Adobe Camera Raw to pull my exposure up a tiny bit, and then increased the contrast to bring up Harry’s eyes and fur. In Photoshop I rather aggressively reduced the noise with a filter, sharpened, and warmed up the tones slightly – all of these things can also be done in Lightroom or all in ACR. In some of my photos, a bit of the background has snuck in around the edges of my white backdrop. To remove this, I simply selected the background colour with the paint dripper (or whatever that little slurpy thing is called) then painted the edges with a soft brush at an opacity of about 60%. This technique can also be used to expand the size of your frame so your cat looks littler in the picture. And there you have it, a simple, half arsed, makeshift method of setting up a mini natural light studio in your lounge to photograph your pet cat. Give it a whirl! I want to see your cat – so remember to share your photos on my facebook page.